The word "Bible" refers to the canonical collections of sacred writings of Judaism and Christianity. Judaism's Bible is often referred to as the Tanakh, or Hebrew Bible, which includes the sacred texts common to both the Christian and Jewish canons. The Christian Bible is also called the Holy Bible, Scriptures, or Word of God. The Roman Catholic and Eastern Orthodox Old Testament canons contain books not found in the Tanakh, but which were found in the Greek Septuagint. More than 14,000 manuscripts and fragments of the Hebrew Tanakh exist, as do numerous copies of the Septuagint, and 5,300 manuscripts of the Greek New Testament, more than any other work of antiquity. According to the Online Etymology Dictionary the word bible is from the early 1300s, from Anglo-Latin biblia, traced from the same word through Medieval Latin and Late Latin, as used in the phrase biblia sacra ("holy books"). This then stemmed from the term ( Greek: τὰ βιβλία τὰ ἅγια ta biblia ta hagia, "the holy books"), which derived from biblion ("paper" or "scroll", the ordinary word for "book"), which was originally a diminutive of byblos ("Egyptian papyrus"), possibly so called from the name of the Phoenician port from which Egyptian papyrus was exported to Greece. Biblical scholar Mark Hamilton states that the Greek phrase ta biblia ("the books") was "an expression Hellenistic Jews used to describe their sacred books several centuries before the time of Jesus," and would have referred to the Septuagint. The Online Etymology Dictionary concludes that the Christian scripture was referred to in Greek as Ta Biblia as early as 223 CE. The word "Bible" replaced Old English biblioðece ("the Scriptures") from the Greek bibliotheke (lit. "book-repository" from biblion + theke, meaning "case, chest, or sheath"), used of the Bible by Jerome and the common Latin word for it until Biblia began to displace it 9c. Use of the word in a figurative sense, as in "any authoritative book" is from 1804. The Hebrew Bible (Hebrew: תנ"ך‎) is a term that refers to the common portions of the Jewish and Christian biblical canons. Its use is favored by some academic Biblical scholars as a neutral term that is preferred in academic writing both to "Old Testament" and to "Tanakh" (an acronym used commonly by Jews but unfamiliar to many English speakers and others) . "Hebrew" in " Hebrew Bible" may refer to either the Hebrew language or to the Hebrew people who historically used Hebrew as a spoken language, and have continuously used the language in prayer and study, or both. Because "Hebrew Bible" refers to the common portions of the Jewish and Christian biblical canons, it does not encompass the deuterocanonical books (largely from the Koine Greek Septuagint translation (LXX), included in the canon of the Roman Catholic and Orthodox churches). Thus the term "Hebrew Bible" corresponds most fully to the Old Testament in use by Protestant denominations (adhering to Jerome's Hebraica veritas doctrine). Nevertheless, the term can be used accurately by all Christian denominations in general contexts, except where reference to specific translations or books is called for. The Hebrew Bible consists of 39 books. Tanakh is an acronym for the three parts of the Hebrew Bible: the Torah ("Teaching/Law" also known as the Pentateuch), Nevi'im ("Prophets"), and Ketuvim ("Writings", or Hagiographa). The Torah, or Jewish scripture. In the background are the Star of David and a Menorah, two important symbols of Judaism. The Torah, or "Teaching," is also known as the five books of Moses, thus Chumash or Pentateuch (Hebrew and Greek for "five," respectively). The Hebrew book titles come from the first words in the respective texts. The Hebrew title for Numbers, however, comes from the fifth word of that text. The Torah focuses on three moments in the changing relationship between God and people. The first eleven chapters of Genesis provide accounts of the creation (or ordering) of the world, and the history of God's early relationship with humanity. The remaining thirty-nine chapters of Genesis provide an account of God's covenant with the Hebrew patriarchs, Abraham, Isaac and Jacob (also called Israel), and Jacob's children (the " Children of Israel"), especially Joseph. It tells of how God commanded Abraham to leave his family and home in the city of Ur, eventually to settle in the land of Canaan, and how the Children of Israel later moved to Egypt. The remaining four books of the Torah tell the story of Moses, who lived hundreds of years after the patriarchs. His story coincides with the story of the liberation of the Children of Israel from slavery in Ancient Egypt, to the renewal of their covenant with God at Mount Sinai, and their wanderings in the desert until a new generation would be ready to enter the land of Canaan. The Torah ends with the death of Moses. Traditionally, the Torah contains the 613 mitzvot, or commandments, of God, revealed during the passage from slavery in the land of Egypt to freedom in the land of Canaan. These commandments provide the basis for Halakha (Jewish religious law). The Torah is divided into fifty-four portions which are read in turn in Jewish liturgy, from the beginning of Genesis to the end of Deuteronomy, each Sabbath. The cycle ends and recommences at the end of Sukkot, which is called Simchat Torah. The Nevi'im, or "Prophets," tells the story of the rise of the Hebrew monarchy, its division into two kingdoms, and the prophets who, in God's name, judged the kings and the Children of Israel. It ends with the conquest of the Kingdom of Israel by the Assyrians and the conquest of the Kingdom of Judah by the Babylonians, and the destruction of the Temple in Jerusalem. Portions of the prophetic books are read by Jews on the Sabbath ( Shabbat). The Book of Jonah is read on Yom Kippur. According to Jewish tradition, Nevi'im is divided into eight books. Contemporary translations subdivide these into seventeen books. The Ketuvim, or "Writings," may have been written during or after the Babylonian Exile but no one can be sure. According to Rabbinic tradition, many of the psalms in the book of Psalms are attributed to David; King Solomon is believed to have written Song of Songs in his youth, Proverbs at the prime of his life, and Ecclesiastes at old age; and the prophet Jeremiah is thought to have written Lamentations. The Book of Ruth is the only biblical book that centers entirely on a non-Jew. The book of Ruth tells the story of a non-Jew (specifically, a Moabite) who married a Jew and, upon his death, followed in the ways of the Jews; according to the Bible, she was the great-grandmother of King David. Five of the books, called "The Five Scrolls" (Megilot), are read on Jewish holidays: Song of Songs on Passover; the Book of Ruth on Shavuot; Lamentations on the Ninth of Av; Ecclesiastes on Sukkot; and the Book of Esther on Purim. Collectively, the Ketuvim contain lyrical poetry, philosophical reflections on life, and the stories of the prophets and other Jewish leaders during the Babylonian exile. It ends with the Persian decree allowing Jews to return to Jerusalem to rebuild the Temple. The Tanakh was mainly written in Biblical Hebrew, with some portions (notably in Daniel and Ezra) in Aramaic. Some time in the 2nd or 3rd century BC, the Torah was translated into Koine Greek, and over the next century, other books were translated (or composed) as well. This translation became known as the Septuagint and was widely used by Greek-speaking Jews, and later by Christians. It differs somewhat from the later standardized Hebrew ( Masoretic Text). This translation was promoted by way of a legend that seventy separate translators all produced identical texts. From the 800s to the 1400s, Jewish scholars today known as Karaites Masoretes compared the text of all known Biblical manuscripts in an effort to create a unified, standardized text. A series of highly similar texts eventually emerged, and any of these texts are known as Masoretic Texts (MT). The Masoretes also added vowel points (called niqqud) to the text, since the original text only contained consonant letters. This sometimes required the selection of an interpretation, since some words differ only in their vowels— their meaning can vary in accordance with the vowels chosen. In antiquity, variant Hebrew readings existed, some of which have survived in the Samaritan Pentateuch, the Dead Sea scrolls, and other ancient fragments, as well as being attested in ancient versions in other languages. Versions of the Septuagint contain several passages and whole books beyond what was included in the Masoretic texts of the Tanakh. In some cases these additions were originally composed in Greek, while in other cases they are translations of Hebrew books or variants not present in the Masoretic texts. Recent discoveries have shown that more of the Septuagint additions have a Hebrew origin than was once thought. While there are no complete surviving manuscripts of the Hebrew texts on which the Septuagint was based, many scholars believe that they represent a different textual tradition ("vorlage") from the one that became the basis for the Masoretic texts. Jews also produced non-literal translations or paraphrases known as targums, primarily in Aramaic. They frequently expanded on the text with additional details taken from Rabbinic oral tradition. By the Hellenistic period of Jewish history, Jews were divided over the nature of the Torah. Some (for example, the Sadducees) believed that the Chumash contained the entire Torah, that is, the entire contents of what God revealed to Moses at Sinai and in the desert. Others, principally the Pharisees, believed that the Chumash represented only that portion of the revelation that had been written down (i.e., the Written Torah or the Written Law), but that the rest of God's revelation had been passed down orally (thus composing the Oral Law or Oral Torah). Orthodox and Masorti and Conservative Judaism state that the Talmud contains some of the Oral Torah. Reform Judaism also gives credence to the Talmud containing the Oral Torah, but, as with the written Torah, asserts that both were inspired by, but not dictated by, God. Christian Old Testament, while having most or all books in common with the Jewish Tanakh, varies from Judaism in the emphasis it places and the interpretations it gives them. The books come in a slightly different order. In addition, some Christian groups recognize additional books as canonical members of the Old Testament, and they may use a different text as the canonical basis for translations. The Septuagint (Greek translation, from Alexandria in Egypt under the Ptolemies) was generally abandoned in favour of the Masoretic text as the basis for translations of the Old Testament into Western languages from Saint Jerome's Vulgate to the present day. In Eastern Christianity, translations based on the Septuagint still prevail. Some modern Western translations make use of the Septuagint to clarify passages in the Masoretic text, where the Septuagint preserves an ancient understanding of the text. They also sometimes adopt variants that appear in texts discovered among the Dead Sea Scrolls. A number of books which are part of the Greek Septuagint but are not found in the Hebrew Bible are often referred to as deutrcanonical books by Roman Catholics referring to a later secondary (i.e. deutero) canonisation. These books are not deuterocanonical for Orthodox Churches because they were always canonical for them. Most Protestants term these books as apocrypha. Evangelicals and those of the Modern Protestant traditions do not accept the deutrocanonical books as canonical, although Protestant Bibles included them until around the 1820s. However the Roman Catholic, Eastern Orthodox, and Oriental Orthodox Churches include these books as part of their Old Testament. The Roman Catholic Church recognizes seven such books ( Tobit, Judith, 1 Maccabees, 2 Maccabees, Wisdom of Solomon, Ecclesiasticus, and Baruch), as well as some passages in Esther and Daniel. Various Orthodox Churches include a few others, typically 3 Maccabees, Psalm 151, 1 Esdras, Odes, Psalms of Solomon, and occasionally 4 Maccabees. The Bible as used by the majority of Christians includes the Hebrew Scripture and the New Testament, which relates the life and teachings of Jesus, the letters of the Apostle Paul and other disciples to the early church and the Book of Revelation. The New Testament was probably completely composed in Koine Greek, the language of the earliest manuscripts. Some scholars believe that parts of the Greek New Testament (in particular, the Gospel of Matthew) are actually a translation of an Aramaic or Hebrew original. Of these, a small number accept the Syriac Peshitta as representative of the original. See further Aramaic primacy. Concerning ancient manuscripts, the three main textual traditions are sometimes called the Western text-type, the Alexandrian text-type, and Byzantine text-type. Together they compose the majority of New Testament manuscripts. There are also several ancient versions in other languages, most important of which are the Syriac (including the Peshitta and the Diatessaron gospel harmony), Ge'ez and the Latin (both the Vetus Latina and the Vulgate). The earliest surviving complete manuscript of the entire Bible is the Codex Amiatinus, a Latin Vulgate edition produced in eighth century England at the double monastery of Wearmouth-Jarrow. The earliest printed edition of the New Testament in Greek appeared in 1516 from the Froben press. It was compiled by Desiderius Erasmus on the basis of the few recent Greek manuscripts, all of Byzantine tradition, at his disposal, which he completed by translating from the Vulgate parts for which he did not have a Greek text. He produced four later editions of the text. Erasmus was a Roman Catholic, but his preference for the textual tradition represented in Byzantine Greek text of the time rather than that in the Latin Vulgate led to him being viewed with suspicion by some authorities of his church. The first edition with critical apparatus (variant readings in manuscripts) was produced by the printer Robert Estienne of Paris in 1550. The type of text printed in this edition and in those of Erasmus became known as the Textus Receptus (Latin for "received text"), a name given to it in the Elzevier edition of 1633, which termed it the text nunc ab omnibus receptum ("now received by all"). Upon it, the churches of the Protestant Reformation based their translations into vernacular languages, such as the King James Version. 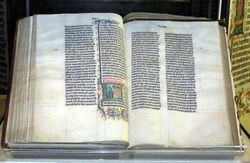 The discovery of older manuscripts, such as the Codex Sinaiticus and the Codex Vaticanus, led scholars to revise their opinion of this text. Karl Lachmann’s critical edition of 1831, based on manuscripts dating from the fourth century and earlier, was intended primarily to demonstrate that the Textus Receptus must finally be corrected by the earlier texts. Later critical texts are based on further scholarly research and the finding of papyrus fragments, which date in some cases from within a few decades of the composition of the New Testament writings. It is on the basis of these that nearly all modern translations or revisions of older translations have been made, though some still prefer the Textus Receptus or the similar "Byzantine Majority Text". While individual books within the Christian Bible present narratives set in certain historical periods, most Christian denominations teach that the Bible itself has an overarching message. At some point in the past, mankind learned to depart from God's will and began to sin. Because no one is free from sin, humanity cannot deal with God directly, so God revealed Himself in ways people could understand. God called Abraham and his progeny to be the means for saving all of mankind. To this end, He gave the Law to Moses. The resulting nation of Israel went through cycles of sin and repentance, yet the prophets show an increasing understanding of the Law as a moral, not just a ceremonial, force. Jesus brought a perfect understanding of the Mosaic Law, that of love and salvation. By His death and resurrection, all who believe are saved and reconciled to God. Many people who identify themselves as Christians, Muslims, or Jews regard the Bible as inspired by God yet written by a variety of imperfect men over thousands of years. Belief in sacred texts is attested to in Jewish antiquity, and this belief can also be seen in the earliest of Christian writings. Various texts of the Bible mention Divine agency in relation to prophetic writings, the most explicit being: 2 Timothy 3:16: "All scripture, inspired of God, is profitable to teach, to reprove, to correct, to instruct in justice." However, the Bible neither gives a list of which texts are inspired and their exact contents, nor a precise theological definition of what inspiration entails. In their book A General Introduction to the Bible, Norman Geisler and William Nix wrote: "The process of inspiration is a mystery of the providence of God, but the result of this process is a verbal, plenary, inerrant, and authoritative record." Some Biblical scholars, particularly Evangelicals, associate inspiration with only the original text; for example some American Protestants adhere to the 1978 Chicago Statement on Biblical Inerrancy which asserted that inspiration applied only to the autographic text of Scripture. It has been theorized that canonical status of some books of the Hebrew Bible was still being discussed between 200 BC and AD 100, and that it had yet to reach definitive form. It is unclear at what point during this period the Jewish canon was fixed, though the Jewish canon which did eventually form did not include all the books found in the various editions of the Septuagint. The Old Testament canon entered into Christian use in the Greek Septuagint translations and original books, and their differing lists of texts. In addition to the Septuagint, Christianity subsequently added various writings that would become the New Testament. Somewhat different lists of accepted works continued to develop in antiquity. In the fourth century a series of synods produced a list of texts equal to the 27-book canon of the New Testament that would be subsequently used to today. Also c. 400, Jerome produced a definitive Latin edition of the Bible (see Vulgate), the canon of which, at the insistence of the Pope, was in accord with the earlier Synods. With the benefit of hindsight it can be said that this process effectively set the New Testament canon, although there are examples of other canonical lists in use after this time. A definitive list did not come from an Ecumenical Council until the Council of Trent (1545-1563). During the Protestant Reformation, certain reformers proposed different canonical lists than what was currently in use. Though not without debate, the list of New Testament books would come to remain the same; however, the Old Testament texts present in the Septuagint, but not included in the Jewish canon, fell out of favour. In time they would come to be removed from most Protestant canons. Hence, in a Catholic context these texts are referred to as deuterocanonical books, whereas in a Protestant context they are referred to as Apocrypha, the label applied to all texts excluded from the Biblical canon. (Confusingly, Catholics and Protestants both describe certain other books, such as the ‘’Acts of Peter’’, as apocryphal). Thus, the Protestant Old Testament of today has a 39-book canon—the number varies from that of the books in the Tanakh (though not in content) because of a different method of division—while the Roman Catholic Church recognizes 46 books as part of the canonical Old Testament. The term “Hebrew Scriptures” is only synonymous with the Protestant Old Testament, not the Catholic, which contains the Hebrew Scriptures and additional texts. Both Catholics and Protestants have the same 27-book New Testament Canon. Canonicity, which involves the discernment of which texts are divinely inspired, is distinct from questions of human authorship and the formation of the books of the Bible. In scholarly writing, ancient translations are frequently referred to as "versions", with the term "translation" being reserved for medieval or modern translations. Bible versions are discussed below, while Bible translations can be found on a separate page. The original texts of the Tanakh were in Hebrew, although some portions were in Aramaic. In addition to the authoritative Masoretic Text, Jews still refer to the Septuagint, the translation of the Hebrew Bible into Greek, and the Targum Onkelos, an Aramaic version of the Bible. The primary Biblical text for early Christians was the Septuagint or (LXX). In addition they translated the Hebrew Bible into several other languages. Translations were made into Syriac, Coptic, Ge'ez and Latin, among other languages. The Latin translations were historically the most important for the Church in the West, while the Greek-speaking East continued to use the Septuagint translation of the Old Testament and had no need to translate the New Testament. Pope Damasus I assembled the first list of books of the Bible at the Council of Rome in 382 A.D. He commissioned Saint Jerome to produce a reliable and consistent text by translating the original Greek and Hebrew texts into Latin. This translation became known as the Latin Vulgate Bible and was declared by the Church to be the only authentic and official Bible. Bible translations for many languages have been made through the various influences of Catholicism, Orthodox, Protestant, etc especially since the Protestant Reformation. The Bible has seen a notably large number of English language translations. The work of Bible translation continues, including by Christian organisations such as Wycliffe Bible Translators ( wycliffe.net), New Tribes Missions ( ntm.org) and the Bible Societies ( biblesociety.org). Of the world's 6,900 languages, 2,400 have some or all of the Bible, 1,600 (spoken by more than a billion people) have translation underway, and some 2,500 (spoken by 270m people) are judged as needing translation to begin. As Hebrew and Greek, the original languages of the Bible, have idioms and concepts not easily translated, there is an on going critical tension about whether it is better to give a word for word translation or to give a translation that gives a parallel idiom in the target language. For instance, in the English language Protestant translations of the Christian Bible, translations like the King James Version, the New Revised Standard Version and the New American Standard Version are seen as literal translations (or "word for word"), whereas translations like the New International Version and New Living Version attempt to give relevant parallel idioms. The Living Bible and The Message are two paraphrases of the Bible that try to convey the original meaning in contemporary language. The further away one gets from word to word translation, the text becomes more readable while relying more on the theological, linguistic or cultural understanding of the translator, which one would not normally expect a lay reader to require. Further, both Hebrew and Greek, like some of the Latin-origin languages, use the male gender of nouns and pronouns to refer to groups that contain both sexes. This creates some difficulty in determining whether a noun should be translated using terms that refer to men only, or men and women inclusively. Some translations avoid the issue by directly translating the word using male only terminology, whereas others try to use inclusive language where the translators believe it to be appropriate. Translations that attempt to use inclusive language are the New Revised Standard Version and the latest edition of the New International Version. The Hebrew Masoretic text contains verse endings as an important feature. According to the Talmudic tradition, the verse endings are of ancient origin. The Masoretic textual tradition also contains section endings called parashiyot, which are indicated by a space within a line (a "closed" section") or a new line beginning (an "open" section). The division of the text reflected in the parashiyot is usually thematic. The parashiyot are not numbered. In early manuscripts (most importantly in Tiberian Masoretic manuscripts, such as the Aleppo codex) an "open" section may also be represented by a blank line, and a "closed" section by a new line that is slightly indented (the preceding line may also not be full). These latter conventions are no longer used in Torah scrolls and printed Hebrew Bibles. In this system the one rule differentiating "open" and "closed" sections is that "open" sections must always begin at the beginning of a new line, while "closed" sections never start at the beginning of a new line. Another related feature of the Masoretic text is the division of the sedarim. This division is not thematic, but is almost entirely based upon the quantity of text. The Byzantines also introduced a chapter division of sorts, called Kephalaia. It is not identical to the present chapters. The current division of the Bible into chapters and the verse numbers within the chapters have no basis in any ancient textual tradition. Rather, they are medieval Christian inventions. They were later adopted by many Jews as well, as technical references within the Hebrew text. Such technical references became crucial to medieval rabbis in the historical context of forced debates with Christian clergy (who used the chapter and verse numbers), especially in late medieval Spain. Chapter divisions were first used by Jews in a 1330 manuscript, and for a printed edition in 1516. However, for the past generation, most Jewish editions of the complete Hebrew Bible have made a systematic effort to relegate chapter and verse numbers to the margins of the text. The division of the Bible into chapters and verses has often elicited severe criticism from traditionalists and modern scholars alike. Critics charge that the text is often divided into chapters in an incoherent way, or at inappropriate rhetorical points, and that it encourages citing passages out of context, in effect turning the Bible into a kind of textual quarry for clerical citations. Nevertheless, the chapter divisions and verse numbers have become indispensable as technical references for Bible study. Stephen Langton is reputed to have been the first to put the chapter divisions into a Vulgate edition of the Bible, in 1205. They were then inserted into Greek manuscripts of the New Testament in the 1400s. Robert Estienne (Robert Stephanus) was the first to number the verses within each chapter, his verse numbers entering printed editions in 1565 (New Testament) and 1571 (Hebrew Bible). Christian apologists advocate a high view of the Bible and sometimes advocate the doctrine of Biblical inerrancy. "Jews preserved it as no other manuscript has ever been preserved. With their massora they kept tabs on every letter, syllable, word and paragraph. They had special classes of men within their culture whose sole duty was to preserve and transmit these documents with practically perfect fidelity – scribes, lawyers, massorettes. The Bible is still loved by millions, read by millions, and studied by millions." Theologians and clerics, most notably Abraham Ibn Ezra, think that there are contradictions in the Bible. Benedict Spinoza concluded from a study of such contradictions that the Torah could not have had a single author, and thus, neither God nor Moses could be the authors of the Torah. By the 19th century, critical scholars, such as Hermann Gunkel and Julius Wellhausen argued that the various books of the Bible were written not by the presumed authors but by a heterogeneous set of authors over a long period. Although Biblical archeology has confirmed the existence of some of the people, places, and events mentioned in the Bible, many critical scholars have argued that the Bible be read not as an accurate historical document, but rather as a work of literature and theology that often draws on historical events — and often draws on non-Hebrew mythology — as primary source material. For these critics the Bible reveals much about the lives and times of its authors. Whether the ideas of these authors have any relevance to contemporary society is left to clerics and adherents of contemporary religions to decide. The documentary hypothesis posits that the Pentateuch (written Torah) has its origins in sources who lived during the time of the United Monarchy or later, labeled J ( Yahwists), E ( Elohim), D ( Deuteronomists), and P ( Priests). These in turn are said to go back to oral traditions, drawing on (and sometimes parodying) earlier ancient Near Eastern mythology. Julius Wellhausen, who in the late 19th century gave this hypothesis a definitive formulation, suggested that these sources were edited together or redacted during the time of Ezra, perhaps by Ezra himself. Since that time Wellhausen's theory has been widely debated by critical scholars (e.g. Yehezkel Kaufman). The In-N-Out fast food chain has hidden bible references on its foods packaging. John 3:16 is often parodied in wrestling and sports by its fans, with a favorite team or team members name, with 3:16, put on a sign held up when cheering. Family Guy references the bible in a similar manner, when Brian reads outloud a non existant line in the bible "And the lord said, Go Sox"
Many manga or graphic novels are alternativly talled Literary Bibles, with no connection to the Christian bible. The Japanese sometimes carry a different meaning for the word Bible (Baibaru), meaning a phrase that one takes to heart. This is notably mentioned in the Japanese pop song "Zankoku Na Tenshi no TE-ZE".